After the GST-led disruption in the June quarter, Bajaj Auto posted improved volumes in the July-September period (Q2). But, beyond volumes, it is the product mix and cost management, which helped Bajaj Auto post better than expected operating performance, which also saw the stock gain over a per cent to close at Rs 3,257 on Tuesday. A 4 per cent year-on-year increase in volumes to 1.07 million units and a similar gain in realisations helped the company posted an 8.6 per cent growth in revenues to Rs 6,579 crore in Q2. While revenues were lower than most estimates that had pegged the number at the Rs 6,700 crore, operating profit margins at 19.7 per cent were better than analyst estimates of about 19 per cent due to lower employee and other expenses as a proportion of sales as compared to the year-ago quarter. In comparison to the year-ago quarter, margins were down by 166 basis points. The margin performance came in despite a 12 per cent jump in raw material costs. As a proportion of sales input costs were 300 basis higher than the year-ago quarter. 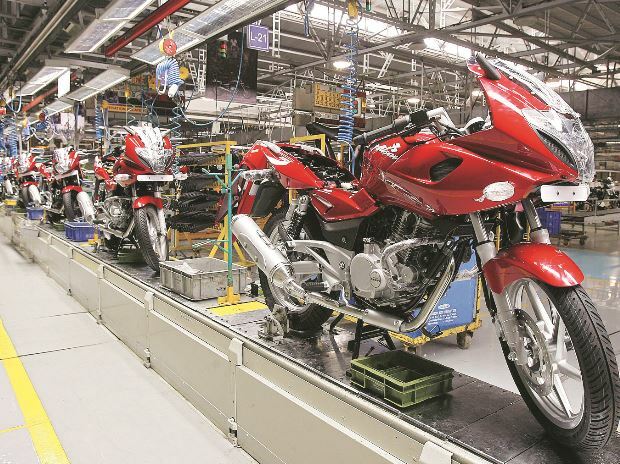 A bigger proportion of higher margin commercial vehicles (14.3 per cent versus 13 per cent year ago), as well as an increasing proportion of premium bikes, helped give stability to the margins. Reported net profit at Rs 1,112 crore, too, was above estimates. Notably, volumes have picked up on a sequential basis, growing 21 per cent. Volumes in recent months for Bajaj have been helped by a sharp jump in three-wheeler sales and stability in two-wheeler portfolio. About 43 per cent of the company's volumes in the quarter came in September, a month wherein it recorded highest ever monthly sales both overall as well as for commercial vehicles. Analysts at JP Morgan believe that the company's wholesale volumes should translate into a better underlying trend over the second half of FY18 reflecting an improvement in exports and three-wheelers and incremental stabilisation in the domestic portfolio. While the trend has been good so far (1.95 million units), given Bajaj Auto's overall target of achieving four million units for FY18, the street will keep a watch on the sustenance of the momentum. The company's entry-level motorcycles Platina and CT100 and their variants have helped improve its market share from 25 per cent to 32 per cent on a sequential basis. Going ahead though, how it improves its share in the premium segment will be important. Given that Dominar and Pulsar have not delivered the volumes the company hoped for, it will have to depend on new launches such as the Avenger 200cc and a new model to be launched in the next fiscal. Exports is another important growth driver, and Bajaj Auto hopes to clock 1.7 million units (0.8 million in the first half) in FY18 to achieve its annual target. What is aiding the export effort is higher sales to newer markets and stability in bigger markets such as Nigeria.